Image via Wikimedia Iguanodons from the Crystal Palace Dinosaurs (1852) These iguanodon sculptures were commissioned in 1852, under the direction of Richard Owen, the scientist who first coined the word “dinosaur” a decade earlier. Originally, dinosaurs were thought to be large reptiles, hence their name being the Greek for “terrible lizard,” and their design here reflects the thinking that they were related to the slow, cold-blooded lizards we know today. Their low stance, drooping abdomens, and flat alligator-like faces are erroneously based on the iguanas from where they got their names. Image via Britannica Modern Iguanodon (2002) Compare the Crystal Palace iguanodons to this more modern recreation and the differences are readily apparent. The modern iguanodon stands higher off the ground, its tail is up off the ground to help balance out its body, and its skull shape has been changed from an alligator-like snout to a sharp beak. It could also stand on its hind legs to reach vegetation, something that Marsh’s iguanodons don’t look capable of. StrangeScience.net Restoration of Stegosaurus by O.C. Marsh (1891) This early recreation of a stegosaurus’ skeleton has some subtle errors that might go unnoticed. Firstly, Marsh arranged the plates on the back in a single row along the spine, though now we believe that the plates would alternate from side-to-side along the spine. Like Owen’s reptilian iguanodons, Marsh’s stegosaurus also has a drooping tail, an error in dinosaur paleoart that persisted for decades across hundreds of species. Photo by Carl Court/Getty Natural History Museum Recreation (2014) This is a modern recreation of the stegosaurus that fixes the plates on the spine, but most notably, changes the position of the dinosaur’s tail. Like other dinosaurs, the stegosaurus would use its tail to balance its weight across its body, but, uniquely, it also may have used it in combat, an ability that makes more sense if the tail isn’t limply drooping on the ground. Image via CharlesKnight.com Laelaps by Charles Knight (1897) These laelaps, now referred to as dryptosaurus, have all the trappings that early reproductions did, particularly the spiny, scaly skin, but what’s most interesting about the work is what it gets right. In 1897, scientists still thought of dinosaurs as sluggish, cold-blooded creatures. Knight’s portrayal of these laelaps, a scene of combat frozen in time, broke from usual depictions of dinosaurs by showing them active and energized. It wouldn’t be until the 1960s that the image of dinosaurs as being slow and cold-blooded would give way to the warm-blooded, quick, active creatures that we imagine today and that Knight depicted here, decades ahead of his time. Image via CharlesKnight.com Tyrannosaurus and Triceratops by Charles Knight (1926) This image, one of the most famous in all of paleoart, is once again from Charles Knight and, like his “Leaping Laelaps,” does a better job than its contemporaries in portraying dinosaur behavior. The ominous feeling of an impending life-or-death battle was rather unique at its time and forever cast the T-Rex and triceratops as mortal enemies in the public consciousness. The most notable inaccuracy here, besides the scaly skin, which is a problem that still won’t go away nearly a century after Knight made this piece, is the T-Rex’s posture. For years, there was debate about whether the T-Rex stood vertically or horizontally. Now we know that it would have been almost completely horizontal (something that Jurassic Park got right). Even still, we often think of it standing vertically, most likely due to early pictures like Knight’s. The T-Rex in the background is far too upright, but his brethren in the foreground is closer to correct, with its head down and its tail in the air for balance. Image via LindaHall.org Deinonychus antirrhopus by Robert Bakker (1969) Robert Bakker’s depiction of the deinonychus antirrhopus is a famous image from the beginning of the “dinosaur renaissance,” a time in the 1960s when science shifted away from the old reptilian model of dinsoaurs, sparking a renewed interest in dinosaurs after their popularity had dropped in the early 20th century. This was the time when the connection between dinosaurs and modern birds first took root as scientific consensus, and depictions of dinosaurs as active and dynamic became the norm. While it still retains the old-fashioned leathery skin, Bakker’s depiction of the denionychus represents his, at the time, controversial belief that dinosaurs were related to birds and that they were warm-blooded, active creatures. The denionychus’ hand bones resemble those of early bird forelimbs and Bakker portrays it in swift motion with a horizontal back and a lifted tail. Image via ScienceBlogs.com Barosaurus by Barry Cox (1975) Cox’s barosaurus features a number of errors including its wildly exaggerated bent neck, a shape that wouldn’t have been physically possible, as well as a tail too short to balance its weight, likely a result of a misinterpretation of Bakker’s drawing. Image via miketaylor.org.uk Barosaurus by Robert Bakker (1971) This barosaurus is another famous image from Bakker, though this one led to a number of bad copies perpetuating inaccuracies in its posture and size. Firstly, their have been numerous scientific debates about how high the barosaurus could hold its head, but it probably wasn’t held as high as it is here. Like T-Rex, barosaurus probably kept its head horizontal with its body. Also, the perspective of the drawing makes its tail look much smaller than it actually was, a problem that was copied by later artists. Image via NPS.gov Barosaurus (2014) This modern depiction of the barosaurus fixes the errors found in both Bakker and Cox’s drawings. Its head is level with the body and its neck isn't bent out of a shape. The tail is also the proper length needed to balance out the creature’s massive body. This recreation also paints the barosaurus in vibrant reds and oranges, a contrast to the muted colors that earlier depictions of dinosaurs used. Image via National Geographic Sinosauropteryx by James Robins (2010) The sinosauropteryx was the first dinosaur to have its color scientifically proven after pigment-bearing organelles called melanosomes were found in its fossilized protofeathers. Not only does the image of a feathered dinosaur conflict with the popular image of a scaly, leathery dinosaur, but the bright yellow color also disrupts the cliche that dinosaurs are colored with muted grays and browns. Photo by by AMNH/R. Mickens, National Geographic Yutyrannus huali (2016) The yutyrannus huali, meaning “feathered tyrant,” is the largest known dinosaur to be found with direct evidence of feathers. This image, of a massive, feathered beast, back horizontal, in motion and angry, is a far cry from the lethargic leathery lizards of the 1800s. But even still, this isn’t how most modern people picture dinosaurs. 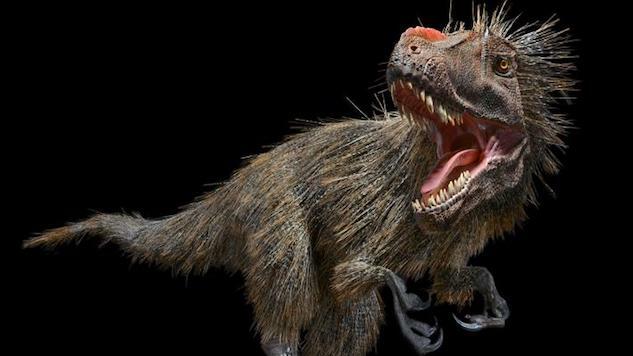 The yutyrannus is a cousin to the T-Rex, and its this connection that led scientists to infer that the most famous dinosaur in the world was likely feathered as well, an image that most people probably wouldn’t accept if it showed up in the next Jurassic Park. Still, whether people believe it or not, this is the most accurate depiction of dinosaurs science has ever offered. Science fiction has a plethora of ideas about what happened in the past and what to expect from the future. Unfortunately, not all of those ideas are exactly plausible in reality. In Suspension of Disbelief, we’ll take a look at the best ideas from sci-fi movies, books, comics and video games to see where (and if) they intersect with the real world. A segment of a dinosaur’s tail, complete with soft tissue and feathers attached, was found trapped in amber earlier last week. As it goes whenever more evidence is found that proves that dinosaurs had feathers, some of the reaction to the news consisted of complete denialism. That reaction is thanks to over a century of dinosaur movies, books, shows and comic books that have all used basically the same aesthetics and tropes to portray dinosaurs. Artists have been basing their dinosaurs on outdated science and as a result our culture’s image and are still deeply stuck decades in the past. Paleontology’s modern understanding of dinosaurs is vastly different from what it was when the word “dinosaur” was coined in 1842. In the ensuing century-and-a-half since, the scientific method, along with constantly progressing state-of-the-art technologies, has raked over the ever-expanding fossil record over and over again to improve our understanding of dinosaurs. Science’s hypotheses about dinosaurs’ size, posture, lifestyle, color, and physiology have all changed and developed over the decades. What we first thought were slow, cold-blooded lizards turned out to be agile, warm-blooded birds. Click through the gallery to see how science’s vision of dinosaurs has evolved in a century-and-a-half. Hailing from upstate New York, Cameron Wade is a freelance writer interested in movies, video games, comic books and more. You can find his work at protogeektheblog.wordpress.com.